A torch light cuts through the darkness. The face of a child grins from the shadows, cocooned in a tunnel of rubbish. “We’ll make a space here to sleep!” he declares, rolling happily in layers of plastic. This evocative opening of Wang Jiuliang’s Plastic China expresses the film’s implicit message in imagistic form: the more affluent we become, the more we are carving out homes built on rubbish. But for all its subtle commentary on a global cycle of production, consumption and waste, Wang’s new documentary is anything but hectoring social comment. His human subjects exude a warmth and aspirational desire that throws the social, economic and environmental complexities of our world into sharp relief. 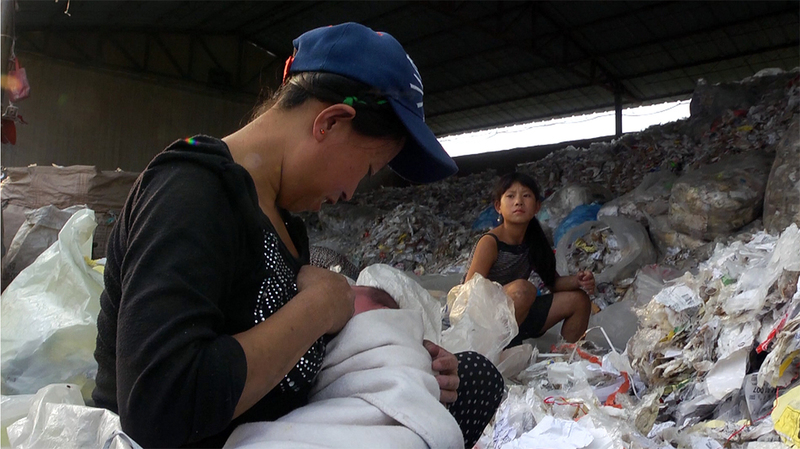 Wang initially made a name for himself as a documentarian with Beijing Besieged by Waste (2011) (trailer below), an alarming exposé of the numerous unregulated rubbish dumps laying siege to China’s capital as its new wealthy and middle classes embrace a throwaway lifestyle. 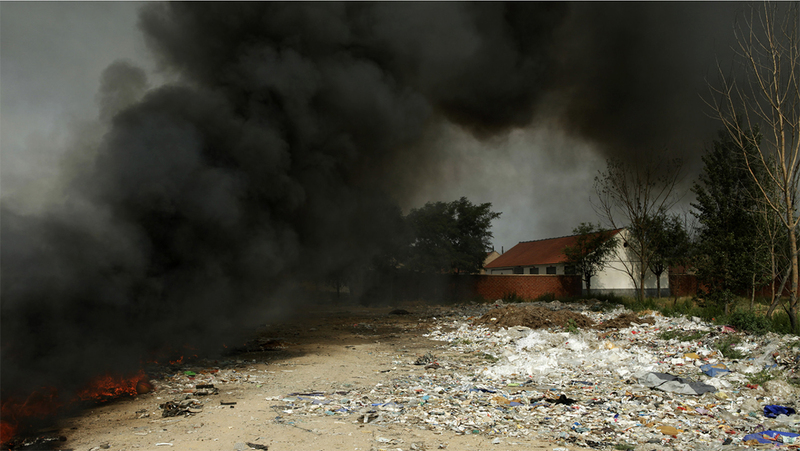 Plastic China was six years in the making, as Wang furthered his investigation of global waste disposal practices in the wake of his first film’s success. Researching in the US, he was shocked to discover massive shipments of American refuse bound for his homeland. In China, the rubbish is recycled, mostly in tiny plants surviving on wafer-thin profit margins made possible by lax safety and environmental standards. 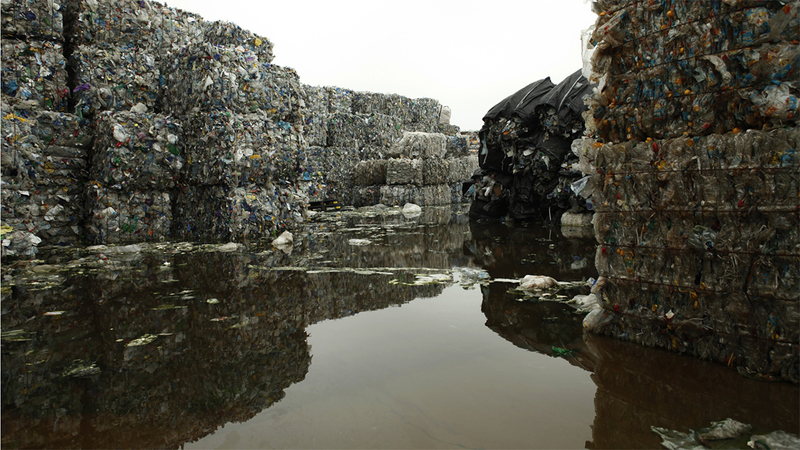 Following the rubbish trail home led Wang to the recycling plant we see in Plastic China, located near Qingdao on China’s north coast. Although the film is largely observational in style, the filmmaker is an embodied presence, whom the onscreen subjects often address to comment on their lives and situations. They are participants in the telling of this story, rather than the passively observed objects of more fly-on-the-wall approaches to documentary. The plant we see is run by Kun, a former farmer in his late 20s with a five-year-old son. He explains to camera that although recycling plastic produces minuscule profits, his income is still higher and more consistent than when he worked the land. Kun and his wife labour hard, feeding large piles of plastic into an industrial shredder by hand. The strips are then melted and shaped into tiny reusable pellets. Rather than recycling, this is actually down-cycling, converting cheap plastic goods into lower grade plastics that are then used to produce yet more disposable items. The down cycling process creates a putrid liquid that fouls local waterways and fumes that pollute the air. Kun endures all this so that he can raise the funds to educate his child. At the other end of the aspirational scale is Peng, a father of five who labours in Kun’s plant for the equivalent of about six dollars a day. The predicament of his 11-year-old daughter, Yi Jie, provides the film’s emotional nexus, her desire for schooling and the chance to transcend her grim surrounds a counterpoint to her father’s wayward alcoholism. Yi Jie is well aware of what her family lacks as she eyes the glossy advertisements from magazines pulled from the imported waste. She and her younger brothers build a “computer” from old boxes, and she gleans a few words of English from a deck of flash-cards rescued from the rubbish. Her family’s poverty heartbreakingly precludes Yi from grasping the opportunities she can see all around her. Although the situation Wang captures is grim, Plastic China resists the temptation to sermonise or provide smug ‘what we can do to help’ solutions. The film also resists easy finger-pointing regarding the pollution pumped out by Kun’s recycling operation, instead adopting a more emotionally detached tone that shows rather than judges. Yi Jie and her brothers live in atrocious conditions, and Kun’s family is barely one step up the social ladder. They are surrounded by images of the good life on television and, more poignantly, in the rubbish they recycle. They have every right to aspire to improve their situation, and Kun’s family at least appears to be on the way to something better, even as Yi’s family appears mired in a poverty trap. Towards the end of the film, Kun takes his family on a visit to Beijing, where they gaze in wonder at the expanse of Tiananmen Square and the towers stretching to the horizon. “You have to get an education,” Kun urges his son, “so that in the future you can bring your dad to live in Beijing. This is where the rich people live.” Given Kun’s drive and intelligence, he and his son might just pull off this dream. Yet the implicit question in all of this is where does the aspirational cycle end? The highlife enjoyed by the West and China’s rich and middle classes is supported by the cheap labour of others, even as those labouring scramble to climb over each other to reach the top of the pile. Meanwhile, we all consume more and more, and produce ever more rubbish, in an ever intensifying cycle of environmental degradation. Why do we all aspire to throw away so much? Are any of us willing to lower our material conditions so that those on the bottom can have something comparable without completely destroying the planet? As Plastic China concludes, another load of imported rubbish is unloaded as Yi Jie and her siblings play among the scraps. Wang’s sophisticated film is one of a number of highly successful works to emerge in recent years produced by CNEX, a non-profit group founded 10 years ago to foster independent documentaries across Taiwan, Hong Kong and mainland China. CNEX has helped filmmakers like Wang tailor their work for a broader global audience. While encouraging the prolonged, empathetic engagement with subjects that has long characterised Chinese documentary, CNEX has urged directors to adopt tighter editing, shorter running times and touches like intertitles to make works more accessible to international viewers. The result of CNEX’s efforts has been a string of recent titles acclaimed at film festivals around the globe, including A Young Patriot (Du Haibin, 2015), The Road (Zhang Zanbo, 2015) and The Chinese Mayor (Zhou Hao, 2014). Plastic China is one of the first Chinese works to cast its gaze beyond China’s shores and consider the complex relationship between Western lifestyles, Chinese aspirations and lingering, entrenched poverty inside the People’s Republic. If China is plastic, Wang’s film shows us, it’s because we became plastic first. If China is polluting, it’s because she has followed the West’s lead. This is a system that implicates all of us, linking the recycling bins outside our homes to the lives of small children in China. Wang may provide no solutions, but he asks questions addressed to us all.